Several species of stink bugs occur in North Carolina. The most common are the green stink bug (Acrosternum hilare), the southern green stink bug (Nezara viridula), and the brown stink bug (Euschistus servus). Recently, a new stink bug, the brown marmorated stink bug (Halyomorpha halys), was introduced and has become common in the eastern United States. The brown marmorated stink bug was first detected in 2001 near Allentown, Pennsylvania. During summer 2010, populations in eastern Virginia and Pennsylvania were very high. Brown marmorated stink bug has been detected in North Carolina but has yet to reach the extremely large population levels see in nearby states. Barrel shaped stink bug eggs are laid in clusters. Stink bug nymphs resemble adult stink bugs in shape but may very in color and are wingless. Nymphs progress through 5 instars before molting to adults. Both nymphs and adults are highly polyphagous, meaning they feed on a wide range of host plants. Stink bug adults are also highly mobile and may move long distances within and between fields. This mobility makes stink bugs very difficult to sample. As the use of scheduled, broad spectrum insecticides in field crops has decreased (most notably in cotton), stink bugs populations have increased across the farmscape. Several predatory bugs, which are beneficial in North Carolina, can be confused with stink bugs. The most common include the spined solider bug (Podisus maculiventris) and the wheel bug (Arilus cristatus). The eggs of these insects are similar in appearance to those of some stink bugs and are also laid in clusters. These beneficial insects feed on caterpillars, aphids, and other soft bodied insects in tobacco and should be conserved. 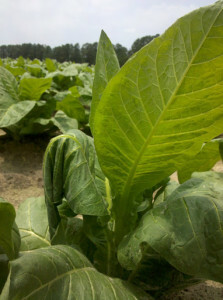 Stink bugs are a minor pest in tobacco and do not typically justify treatment. It is more important to understand what stink bug injury looks like so it is not confused with other damage (pathogens or insects) than to assess whether treatment is necessary. Stink bugs feed on the mid ribs of tobacco leaves, which then wilt and bend. This damage occurs primarily on upper stalk leaves. If plants are healthy and there is adequate moisture, leaves should recover. If they remain wilted, however, there is a chance that leaves will scald in the sun. These should not, however, render leaves unmarketable, and damage is typically infrequent even when large stink bug populations are present.